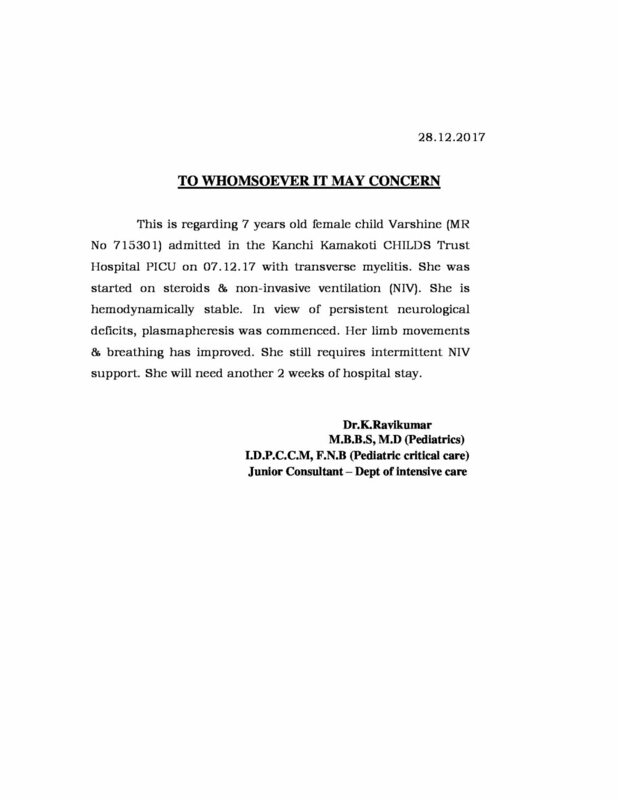 A few days back 7-year-old Varshine, daughter of Duraivel, was rushed to the hospital and was diagnosed with this condition called Transverse myelitis which is a neurological condition in which the spinal cord is inflamed and causes nerve damage. Varshine is now in the ICU on medical management and will need to remain to be in the hospital for another 1 month. 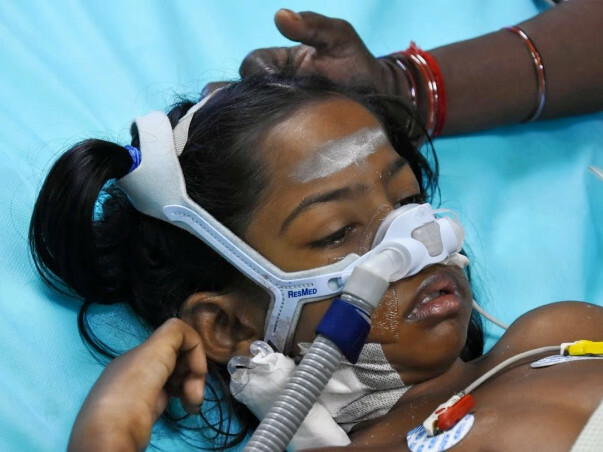 The total cost of her treatment is around 8 lakh Rs. Unfortunately, this is far too much for Duraivel to afford as he only earns only 12k per month. He needs our help to save his daughter. Your contribution can give Varshine the treatment she deserves. Thank you for all the wonderful support that you have shown Varshine so far. 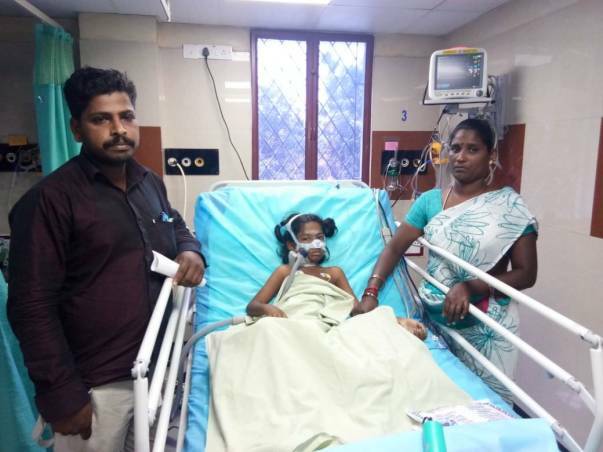 Your support and blessings have helped her in recovering faster. She is able to move her right hand now. She is also able to bend her left leg and move it around. However, her right leg will take some time to recover and the doctors have suggested her undergo physiotherapy. Based on her recovery the doctors discharged her and have suggested follow-ups. Thank you all for all the wonderful support you have shown towards her. Do pray for her speedy recovery. Thank you for all the support you have shown Varhsine and her family. This is to inform you that Varshine is hemodynamically stable. Her limb movements & breathing has improved. She still requires intermittent NIV support. 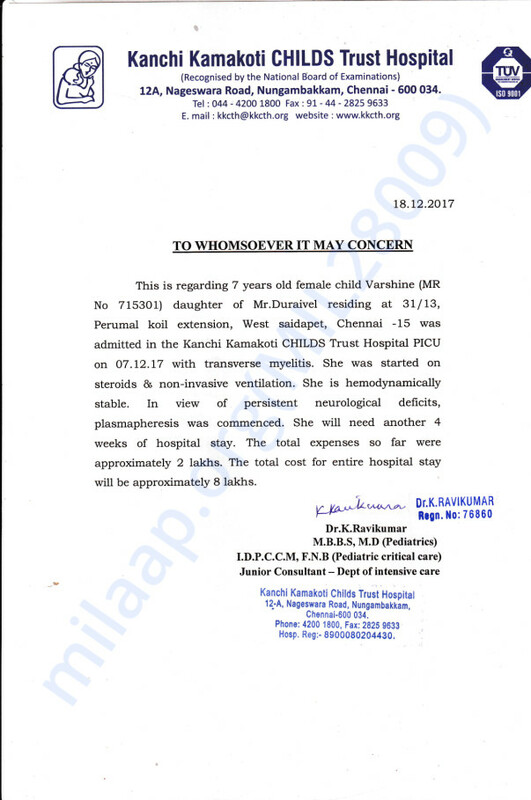 She will need another 2 weeks of hospital stay. Please do continue to support her family and pray for her good health.